Gideon, I have just read this all the way through again but (unless I have been stupid and missed it) how many batteries?, what do you think their combined weight will be?, where will they be positioned? and with the weight of the batteries and the 2 gensets would this still be lighter than 2 x 30hp diesels and a smaller genset?, just out of curiosity, as I think the idea is great. ps any more info on the 405/410 yet?? E400,000 is a new MaineCat41 and a small house here, but You have scored a Bullseye with me. I have a few quibbles, though. A sturdy outward opening companionway hatch would be reassuring, as would some very large drains in the salon floor (with a simple flap for a check valve) to drain driven rain if not a pooping sea. 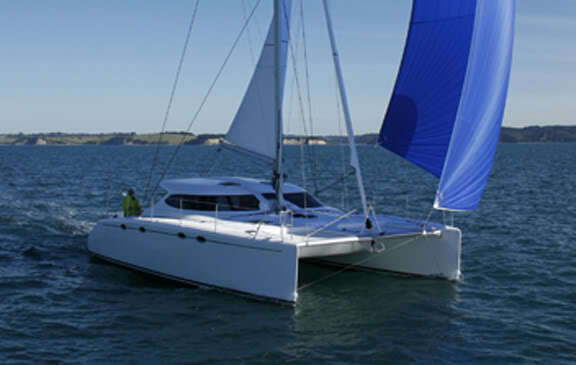 The bimini top must be sturdy enough to kneel or stand on when working on the mainsail. Needs non-skid, and wiring chases for solar panels and mushroom antennas. PLEASE incorporate enough electrical and plumbing chases to allow easy future additions. These could be flush mounted antennas on the cabin roof, a rain collector on the bimini, replacement hull transducers, a (gasp) radar and/or N2K weather station on the masthead, plus whatever new comes along in the next twenty years. I hope that there is enough room at trhe helm to mount a big multifunction display at the helm and one at the nav station, with easy wire channels between the two. A wide door in front of a shielded electronics bay would be very nice. 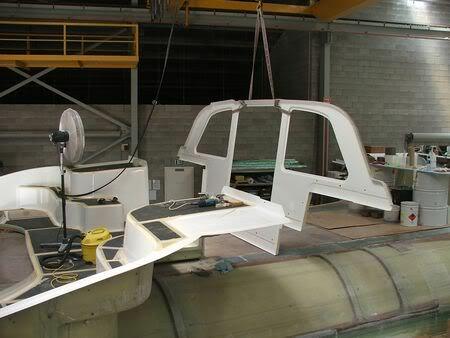 provide a way to hang fenders at virtually any position along the hulls. 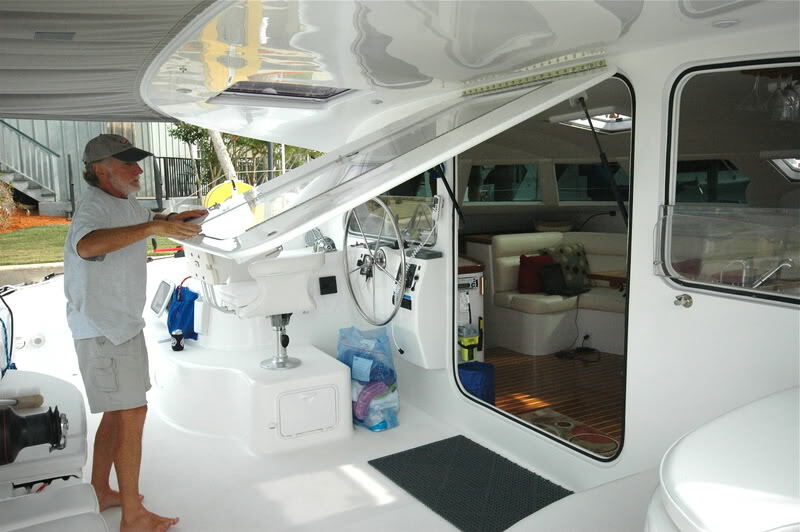 Leave at least one bow locker deep enough to hang fenders and wet docklines to dry out. And I hope there is enough room around the engines for a full removeable sound shield and access for really serious maintenance. 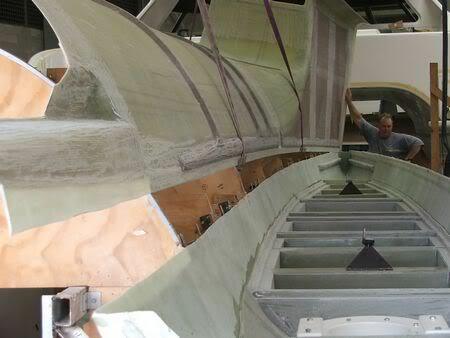 Build in a place near each transom to attach chainplates for a drag device. Incorporate a mounting for a single pole boarding ladder, that extends at least 4 feet below the water. Perhaps just a glue on wart (or bollock) on the bottom step. Explore (via computer simulation) how the cat would float inverted in the hope of rigging a few temporary berths above the inverted water line. Make some of the less acccessible voids airtanks to float the boat higher or more evenly when inverted. Offer escape hatches, nonskid on the surface of the bridgedeck, and pad eyes (or just mounting sites for lifelines, and an emergency equipment bin accessible from both the top and the bottom. Mount the EPIRB where it can be reached and activated from both right-side-up and inverted. Protect the freshwater tanks from seawater contamination, perhaps with just a check valve and a flopping pickup. Protect the fuel tanks from leaking inverted, and explore some way of protecting the batteries for the same reason. Build in lightweight ladders or steps into any compartment more than hip deep. Make the rudder posts strong enough to hang the boat on. Make the emergency tiller actually useable, possibly with small block and tackle. 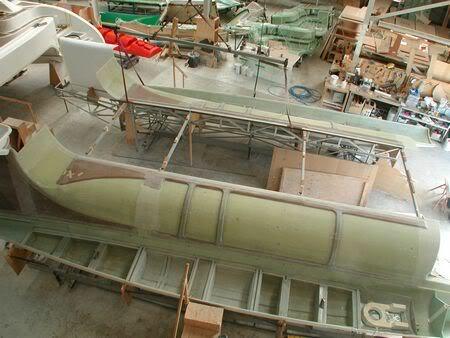 Make a place to store a spare dagger board and rudder if desired. Facilitate installing a storm jib tacked to the back of the trampoline. Facilitate a bowsprit or prodder than can be positioned to port or starboard for tighter sheeting angles and to stay out of the way of the genoa. Facilitate an optional rotating partial wing mast, with a top plate for masthead light and weather transducer that doesn't rotate. It could be a torque tube from the forestay tang swivel. Incorporate an optional copper mesh ground plane (ssb antenna counterfoil) into your layup schedule so that it is sealed and protected from damage, but has wide clamps for foil attachment. And lose a pound or two while you're doing all that! Perhaps just a glue on wart (or bollock) on the bottom step. Do you know what the word is highlighted in red above means in English? Now I do. But that's just Englandish! Its OK in Amurkin. By the way, is it impolite to refer collectively to South Africans, New Zealanders and Australians as "southern hemisphere"? And was the Prout 50 originally built with a 20' beam? Where have I seen the New Fastcat 405 before...let me think! Anyone else see a little design plagiarism here? The total design and all the dimensions are nearly identical, even down to the replaceable hull nose. 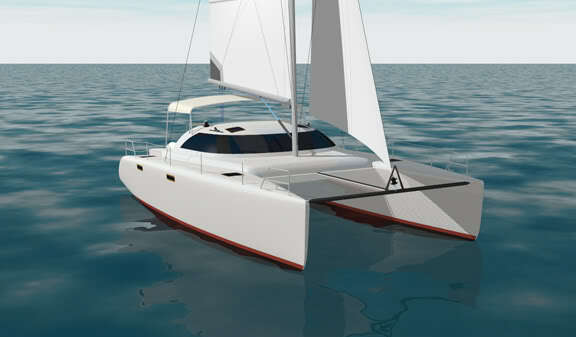 Do you have any connection to Fusion Catamarans ? Have you moved up from your C&C40 to a Cat’, yet ? As an Admin, why do you ask:rolleyes: No I have no commercial connection to Fusion or anyone. I'm a retired engineer. I'm jazzing Gideon because I think, even with his creative efforts to make his cats light, he gets a little over zealous with his Fastcat weight saving claims and now that the Fastcat 405 is a new design. The Fusion 40 I saw up close at my marina can be a very nice boat if you get the right builder and keep personally involved with construction. I think their parts compound angle molds construction process adds a lot of strength and quality control to building a cat, but I prefer a little larger cat for long term cruising and higher load handling. I just put my C&C 40 on the market to make room for the right cat. I don't need two boats and to be paying two dock fees.C&C 40 Finding and deciding on the right cat is a moving target. I see you have a C&C 29. I know where you can get a nice C&C 40 and move up! ...I just put my C&C 40 on the market to make room for the right cat. I don't need two boats and to be paying two dock fees.C&C 40 Finding and deciding on the right cat is a moving target. I see you have a C&C 29. I know where you can get a nice C&C 40 and move up! I asked as a curious Member, not an Administrator. As an Administrator, I might have (but didn’t) asked if you had permission to re-publish those Photographs. Our C&C29 sold (2001) to the first prospect; and we’re boatless, but not currently in the market. From the descriptions and photos, yours is one of the finest C&C40s I’ve ever seen! Good luck selling her, and moving “up” to a Cat. 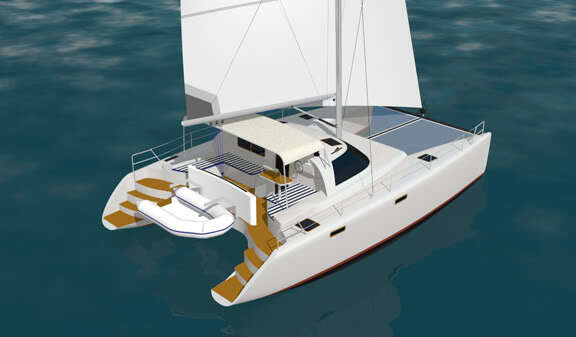 Regarding design, many designers come up with very similar looking catamarans as consensus grows over the years as to what makes a good design. In my opinion it's sort of a darwinian evolution, where there is initial variety and competition for insufficient resources (money) those that survive are best suited for their environment. In the beginning there was great variety, but over time these designs all started to become more similar. Now the two groups of cats, owner designed and charter designed are really seperating out from each other quite a bit, but within those classes they frequently borrow ideas. Look at the broad foredeck netted space and narrow hull entry in the Catana, FP, the PDQ 44, St Francis, Fusion, etc with the narrow hulls and wrap around settee windows, at a glance they all look very similar. 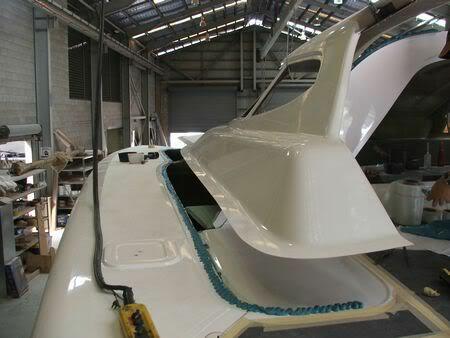 Some other design choices such as number of water tight accomodations, inside hull births versus bridgedeck births, etc still exist because of storage versus speed considerations for owner designed boats. But I think the real differentiators for owner designed boats are things like how much space inside is kept in water tight compartments vs accomodations, electrical engine implimentations with retractible drive legs and lightweight expensive batteries vs diesels, core materials and choices of resin and types of infusion methods. 1. The Fusion has dual helms with a rather large blind spot forward from either helm; the Fascat has a single raised helm with 360 degree visibility. 2. The bridgedeck on the Fusion extends further aft and forward. 3. The Fusion uses sliding 'patio' doors. All three of the above distinctions would make the Fusion heavier, even assuming that all other aspects of construction and equipment were the same (and they are not). Other differences include the coachouse profile, the portlight profile and even the sheer line. They are, however, both modern cats of a similar size and consequently, share numerous basic attributes. The fusion is a 4 cabin cat, with forward and aft births extending over the bridgedeck. the african cat has two aft cabins only and the forward section is heads. That would be a huge difference in weight. Wrong....the Fusion is totally customizable, both in the hulls and in the cabin. The one I show in the photos is a two cabin layout. They have a two, three and four cabin layout. The same flexibility to meet customer preference holds true for the deck layout and wheel or wheels location, single door or sliding doors, etc. Here is a single wheel and a non-sliding, flip up single door for a wide open Catana type feel. Does this make it a new boat design? 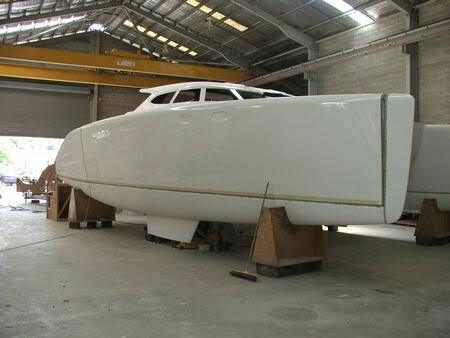 The little changes and reversing the transom curve doesn't make it a new boat design. But good try guys to stick up for Gideon, but sorry it's the same boat design. 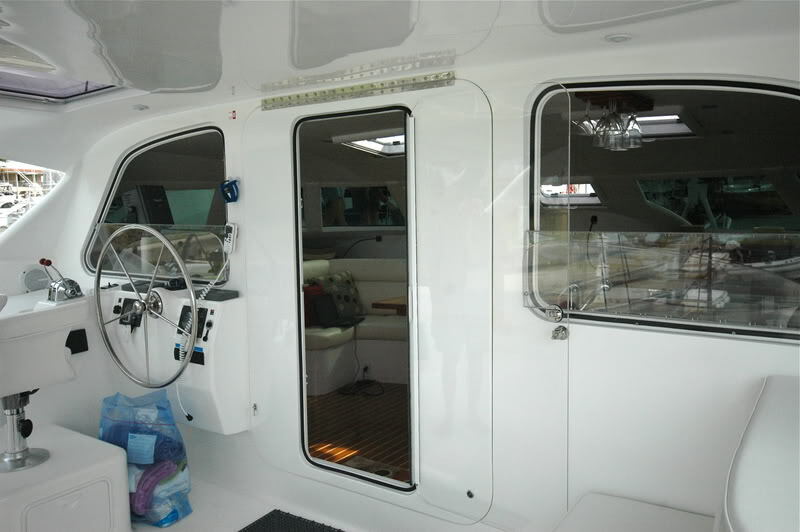 Plus, if the Fastcat 405 rendering showed the helm size in the proper perspective relative to the actual size of a person standing or seated, he would probably want to reverse the transom to gain the added needed space. I'm not standing up for Gideon, but rather was pointing out some differences as between the posted images of the two designs. I still see differences in the length of the bridgedeck, both fore and aft, the coachouse profile and the sheer line (which revereses down a bit at the bow of the Fusion). 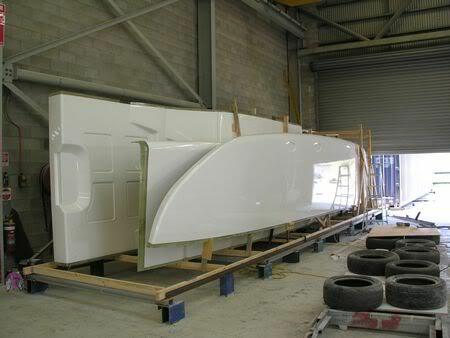 Frankly, if you looked at the designs of numerous monohulls from various periods you would also see huge similarities. I guess where I quarrel is with the term 'plagiarism' - a term which properly applies to numerous Chinese cars that are a direct copy of the products of Toyota, for example, but for the badges/interior trim. Yes there are striking similarites between these designs (and also some of the new FP's). And is the use of the flip-up companionway door on this particular Fusion plagiarism, or replicating/building on an idea that has been put to good use by others? In any case, my point is not to knock the Fusion, nor to defend Gideon and the Fastcat. I just don't believe that the term 'plagiarism' is any more appropriate here than it was in the mid 80's when comparing various Beneteaus, Junneaus, Pearsons, Mirages, Elites etc. 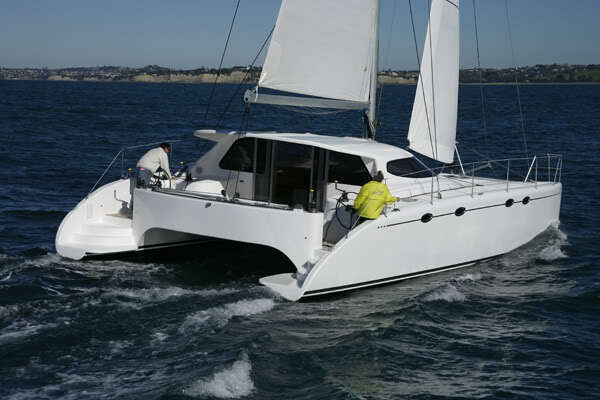 that moved towards the aft head, aft cabin layout in monohulls in the 27 to 40 foot range. just trying to understand, the "2 cabin" version on the sport version still extends the bridgedeck way in front of the salon? What is the space of the birth being used for in the two versus 4 cabin? Storage? If you look at the deck pictures it appears the only difference is one has hatches over where the births would be and the other is solid deck.